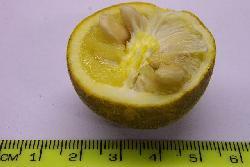 Here is a shot of the seeds in the fruit - it looks just like a small lemon. The best time to look for mystery seeds is in the fall, or the spring, or the summer. Occasionally in the winter. Look anywhere for a tree you don't recognize - this is a mystery tree. 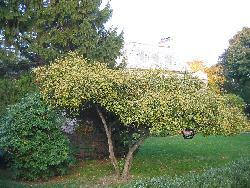 This particular tree is readily visible in the early fall, when the leaves just begin to fall. 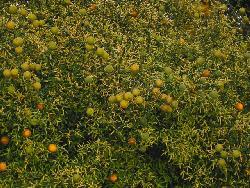 You will see the yellow fruits and wonder why an orange or lemon tree is growing up here in the north. Also, when you go to grab one of the fruits, the thorns will rip all the flesh from your hand. I found these babies while walking on Kentmere Parkway in the fall, when the leaves had fallen off the plant. I spotted the fruits from across the street, which, with my eyes before Lasik, is a good indication of how these fruits stood out. 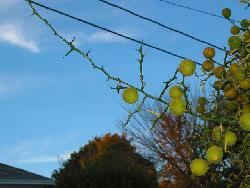 The plants are extremely thorny, so it was a game to get the fruits without needing a transfusion. I have since spotted several more of these plants, including a tree-sized guy, near where I collect Kentucky coffeetree pods. I researched lemon tree seeds a little last fall. I took the seeds from one fruit and aged it over the winter in a plastic bag of wet perlite. I found that almost all of the seeds had sprouted when I checked the bag on April 15th. I also saved some of the fruits in a plastic bag; they had all molded, but the seeds inside still look OK, even though they hadn't germinated. I planted both the sprouts, and just some of the seeds; all the seeds germinated, and everything is alive and well. Next year I will just plant from the fruit. This web page has some good info.